Is PFI bankrupting the NHS? What demands should we make? How can we rebuild the NHS? Hannah Basson – an NHS health worker and Equalities Officer for the Gloucester Health branch of Unite the Union (personal capacity). Cllr Caroline Molloy – Editor of the OurNHS website, freelance writer, and Green district councillor for Stroud Central. Chris Moore – led the local anti-poll-tax non-payment campaign in the 1990s, Trade Unionists and Socialists against Cuts (TUSC) candidate. 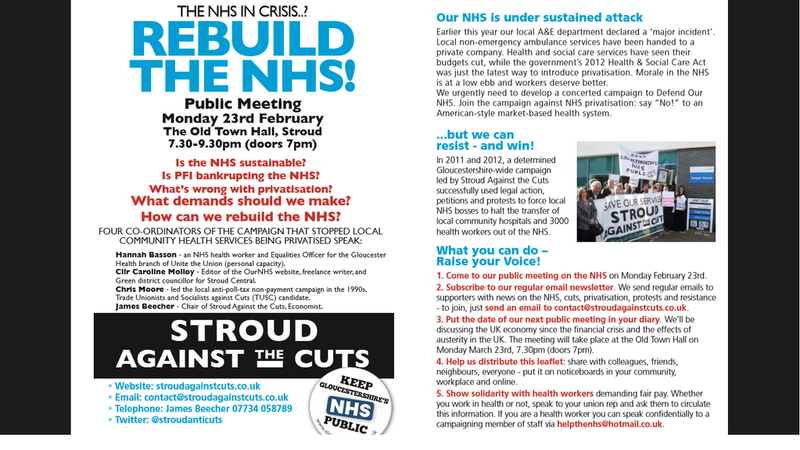 James Beecher – Chair of Stroud Against the Cuts, Economist. Earlier this year our local A&E department declared a ‘major incident’. is at a low ebb and workers deserve better.